From the day of diagnosis through treatment, side effects and evaluations, cancer patients have a tough road to recovery. We’ve been on that road and remember that it’s the simple gifts in life that make a difference. 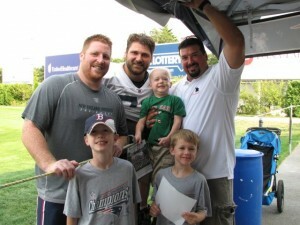 The Joe Andruzzi Foundation teamed up with the New England Patriots to bring patients and their families up close and personal with some of their local football heroes. Known as “Dream Camp,” we gave about 20 patients per event from Dana-Farber Cancer Institute and their families the opportunity to get outside and away from worrying about the transfer of germs. Those who attended on August 2 enjoyed an indoor practice session from a suite. 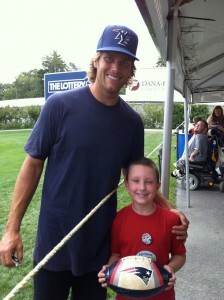 On August 3 and 10, attendees watched the players from the New England Patriots Charitable Foundation tent. Joe brought his Super Bowl rings for the kids to try on in addition to taking photos and signing autographs. The response from families was overwhelmingly positive. It was a memorable event for everyone. Thank you very much to the New England Patriots Charitable Foundation for generously donating gift bags that topped off a spectacular outing.